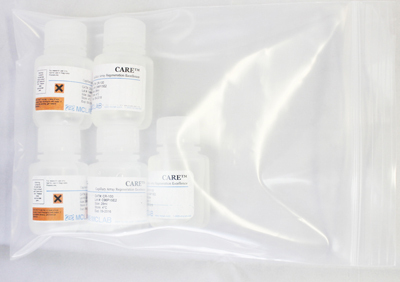 TAE buffer is the most commonly used buffer for DNA agarose gel electrophoresis but is also used for non-denaturing RNA agarose gel electrophoresis1. 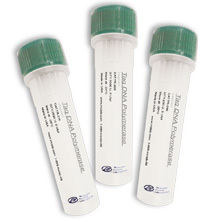 Double-stranded DNA tends to run faster in TAE than in other buffers but can also become exhausted during extended electrophoresis. Dilution of the concentrated TAE buffer produces a 1× TAE buffer with 40 mM Tris-acetate and 1 mM EDTA, pH 8.3. 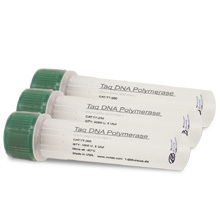 The 1× TAE buffer is used both in the agarose gel and as a running buffer. Casting and running buffer for agarose gel electrophoresis of nucleic acids. 0.4M Tris base, 0.4M acetate, 10mM EDTA, pH 8.0.